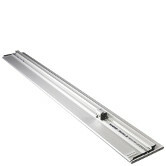 Cuts materials that are longer than the length of the cutter as a result of an innovative hinge and lift arm mechanism. Hold work securely, thanks to a full-length silicone rubber grip strip mounted in the surface of the base, and two more on the underside of the cutter bar. 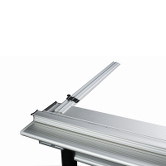 Relies on an extruded anodized aluminum base that incorporates a narrow groove to accept the blade tip when cutting. The Sabre Series 2 GPC is designed for use on a bench or attached to the optional stand or stand package.